Remember this page from yesterday? 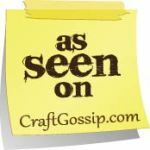 I had a lovely message to ask if I'd be happy to be the 'Inspiration du jour' on Craft Gossip. But of course!